Paul Tisdale is no stranger to the League 2 Player of the Year James Norwood. 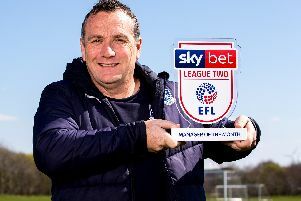 The Tranmere Rovers striker has scored a remarkable 29 goals in 43 appearances this season, landing the league's best prize at the EFL Awards last weekend. But back in 2009, then Exeter boss Tisdale plucked the striker from college to bring him to St James Park, handing him his debut at Elland Road on the opening day of the season. Fast forward 10 years, Norwood will be aiming to foil his former manager's promotion plans, with a Rovers win moving them within a point of Dons in the race for the automatics. While Tisdale holds fond memories of the player he signed as an 18-year-old, he admitted he will be out to keep the 28-year-old quiet at Prenton Park on Saturday. "We'll be doing everything we can to keep him quiet, which is easier said than done of course," said Tisdale. "But Tranmere aren't about one player. He is part of a really good team. He has had an incredible season. "I signed him from Exeter from college. He was very young, I remember his debut, coming on as a substitute against Leeds at Elland Road. He was only on for about 15 minutes, he did a couple of really good things. "I get on really well with him, he's a likeable chap, but in the last couple of seasons has really developed as a footballer. He's developed his craft and is very good at it. I liked speaking to him earlier in the season, he has really come into the prime of his career."